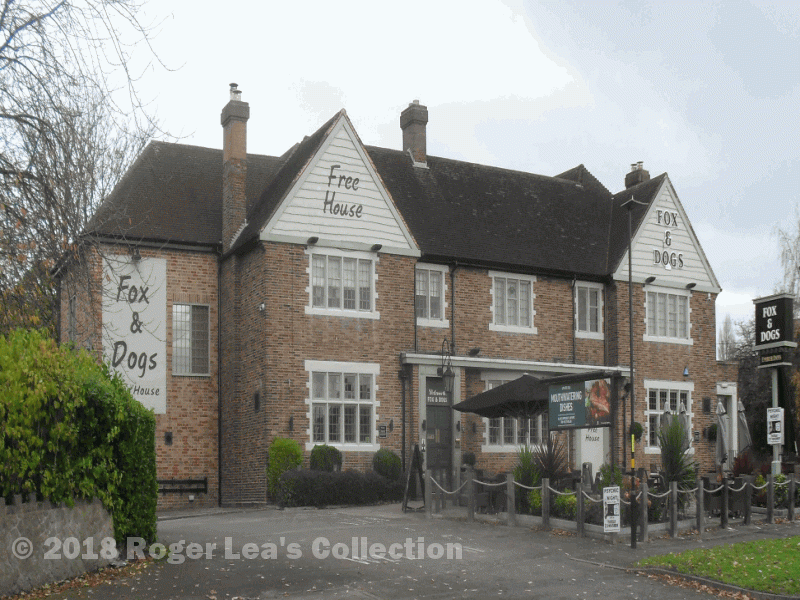 The earliest mention of the Fox and Dogs dates from November 1751, when a coroner’s inquest was held at “The Dwelling House of Samuel Smith at Little Sutton known by the sign of the Fox and Dogs”. It was probably much older, perhaps the home of one of the four alewives referred to in the 1416 court roll - “Margaret Gybon, Isabell Cole, Christine Whateley and Julia Pentrich”, and even before the Norman Conquest the Saxon villagers of Little Sutton must have had an ale-house to go to for relaxation. Samuel Smith was succeeded as landlord of the Fox and Dogs by William Lambley, licenced in 1761. The pub was part of the Moor Hall Estate of F.B.Hacket in 1824, William Marler being the tenant landlord and famer of 90 acres, the land scattered in twenty-five fields, some in each of the three old open fields of the village. In 1856 Samuel Langley was the tenant, but only farming 50 acres; the inn is described as a two-storey building measuring thirty feet long and forty feet wide. Samuel Langley married his housekeeper on January 12th 1869, and, according to the newspaper report, “to celebrate the auspicious event invited some of his neighbours to supper. Some of the guests, having imbibed too much of the Burton ale, and being desirous of some tea or coffee, helped themselves to it, and being short of sugar to improve the flavour, added a dip candle to the hot water.” Langley ordered them to leave the premises, but they refused to go. They were had up before the magistrate for disorderly conduct, found guilty and ordered to pay sixpence each plus costs or spend 7 days in prison. Four of them, William Allport, Joseph Allsop, Thomas Hollins and Joseph Wallin, all of them local farm labourers, “being desirous of a change, preferred a visit to Warwick” (the house of correction was there); a fifth man, Thomas Storer of Mere Green, paid the fine. Langley must have left soon afterwards, as the landlord in 1871 was William Burton, inn-keeper and farmer; he was succeeded by his son, another William Burton; by 1891 Burton’s widow Fanny was living in a nearby farmhouse with her six-year old son William, while the Fox and Dogs was in the hands of John Plant. Young William Burton is listed as servant to John Plant in 1901. The present “palatial” Fox and Dogs replaced an older pub in the 1930s.